Talking to Mihalis Eleftheriou about languages will defy every notion you’ve created about learning a language. 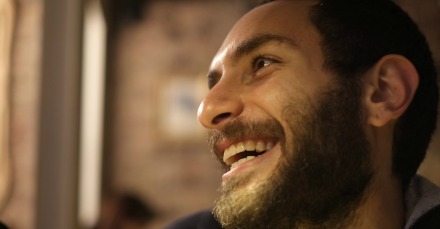 His enthusiasm and critical approach towards the learning process ignite interest; and its perhaps his ability to get one hooked on deconstructing the structure of the languages around us that instigate change in the way you think, learn and eventually become a ‘master linguist’, as Eleftheriou says. Eleftheriou was born in Cyprus and soon moved to England were he was challenged initially with a language barriers but also a cultural one; being from the Diaspora taught him to talk loudly and make prominent gestures with his hands, something that intimidated his friends to be. Academically, Elefetheriou began a law degree, disagreeing with the ‘unreal’ nature of the subject, as he says, it’s when he took a Spanish Language course that he knew he had found what he wanted to do. “I thought it was really difficult and intangible but it was amazing. It was like magic; these different incomprehensible music coming out of people’s mouths,” recalls Elefetheriou. Yet the more you talk to Eleftheriou, the more you realize that language learning, or in this case the Language Transfer course that Eleftheriou has been working on since 2011 goes much deeper that merely the sound and grammar of languages. “Languages have such a huge potential to open your mind; to change your identity because all of our identities are based on stories, about who you are, what you are, what you represent, who are they etc,” instigates Eleftheriou. “And If ignore the stories and move past them and listen to the words being used to tell these stories, it contradicts everything they are saying. It doesn’t make any sense because you have a certain word which you can trace back to Arabic, or Turkish and another one which is half Arabic and half Creek and if you stick it together and make another word, it means something entirely different. All languages are full of this, we are one big symbiotic, palpitating mesh,” continues Eleftheriou. Here we obviously touch upon the importance of using and perhaps knowing a language well before you begin to make use it unwittingly, perhaps. “Everyone needs to be very well aware of their language in order not to become a victim of it. We’re saying things all the time that we don’t mean. We are putting ideas across all the time that we don’t mean,” emphasizes Eleftheriou. But language will always be the one element which differentiates us from any other animal. “We do not exist without each other and even that is a complex sentence,” laughs Eleftheriou, correcting himself to prove a point. “You can’t say we do not exist without each other because there is actually no other, there is no Greeks and Turks; there are no languages. There are only dialects. Elefetheriou’s initiative, named Language Transfer, is a project which offers free downloadable language courses with a methodology that explores the pluralism in our languages and teaches practical speaking in no time. In order to achieve this, Eleftheriou uses a method called the thinking method which as a base shows people that if they lost their learner’s confidence at school, it was because the school was wrong, it was not their fault. “Teaching people how to learn, in the paradigm of learning in school, implies that the more information you’re fed the scarier it is, because you have to memorise everything. If I give you a lot of background information it’s overwhelming because you are programmed to memorise it,” explains Elefehtiou. With the thinking method, however, no one is expected to memorise anything. You’re expected to think about everything. Half of it is content and the other half is about the language and there are learning skills included too. “Also included in the courses are the careless errors that are made through not thinking. We analyse the mental processes and what the mental processes are when you don’t take control of them,” adds Eleftheriou. What’s more, the courses push you to understand how to analyse language, how to think about it, how to get interested in it, and its also about proving people’s language consciousness.